Julia Meade in a photo from the taping of a Hidden Magic TV commercial, circa late 1960s. Hidden Magic was a hairspray that, "Holds and holds and yet loves to be combed." For years the official spokesperson for Hidden magic was a fictitious character, Wanda the Witch, and the ads took on a 'Bewitched' flavor. 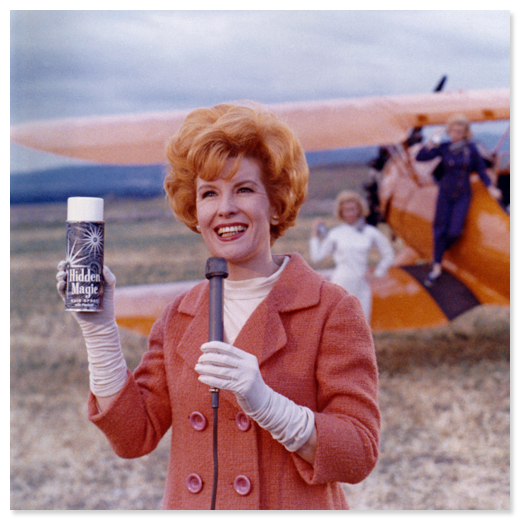 Using Julia, who was known for her flaming red hair, as spokesperson changed all that and brought the commercials into the mainstream.